University of California Press, 9780520255050, 386pp. Ninety percent of the large fish in the world's oceans have disappeared in the past half century, causing the collapse of fisheries along with numerous fish species. In this hard-hitting, provocative expose, Charles Clover reveals the dark underbelly and hidden costs of putting food on the table at home and in restaurants. From the Tsukiji fish market in Tokyo to a seafood restaurant on the North Sea and a trawler off the coast of Spain, Clover pursues the sobering truth about the plight of fish. Along with the ecological impact wrought by industrial fishing, he reports on the implications for our diet, particularly our need for omega-3 fatty acids. This intelligent, readable, and balanced account serves as a timely warning to the general public as well as to scientists, regulators, legislators--and all fishing enthusiasts. Charles Clover is a journalist and the environment editor of the Daily Telegraph in London. 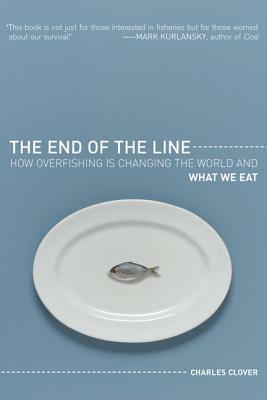 The End of the Line has received the Guild of Food Writers' Derek Cooper Award for Investigative Journalism, the Zoological Society for London's Biosis award for communicating zoology, and a special commendation from the Andre Simon Memorial Fund Book Awards.